My parents go to the swap meet at the former Saugus Speedway every Sunday. But "you have to go early to get anything good" according to my Dad. I only go with them every few weeks. For those of you who don't know what a swap meet is, it's the same as a flea market. This one has lots of people who peddle odds and ends (junk) as opposed to retail type of items. Normally, I don't have anything in particular that I'm looking for, aside from spending time with my parents. But this time, I had a mission! I've always loved rosaries. 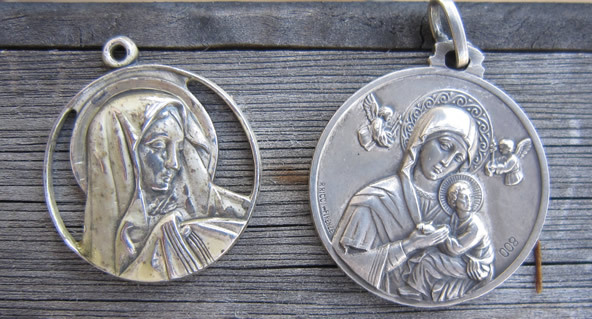 I decided I was interested in finding rosary components as well as other devotional items, like religious medals. When you have a mission at the swap meet, it becomes much more exciting. Suddenly, it turns into a treasure hunt! My mother is a natural bargain hunter, so I think this got her adrenalin going too. The first items I purchase are these cross charms and religious medals. 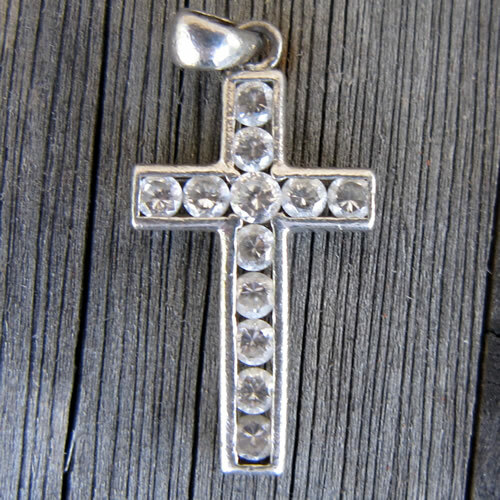 All are sterling silver, some have cubic zirconia. I'm sure they were all significantly cheaper than I could have bought them online. There are several more than the ones pictured here, but I'd like to save something to post another day. 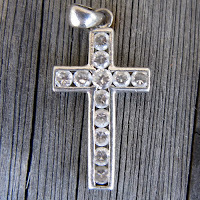 One very unusual item is the pendant centered between the two crosses. 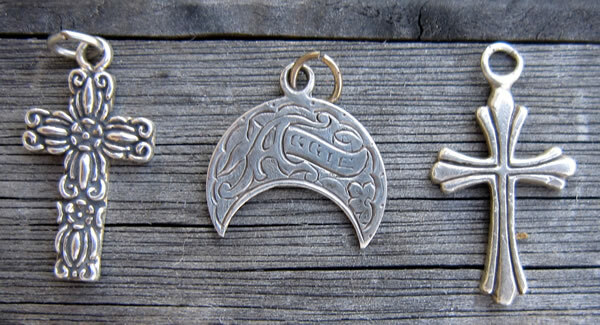 It is a Canadian coin that has been cut into a crescent shape and then engraved to say 'Aggie'. You can see the coin on the other side (which I did not take a picture of!). I'm not sure what I'll actually do with it, but it was so unusual and pretty that I had no problem spending $1 for it. I guess if I find a Canadian who went to Texas A&M (their team athletics nickname is the Aggies), I'll be able to sell it! I believe it is silver, just like older US quarters and dimes are. 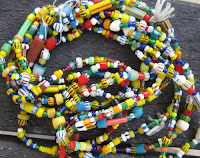 In addition to the silver charms, I couldn't pass up several strands of African trade beads. 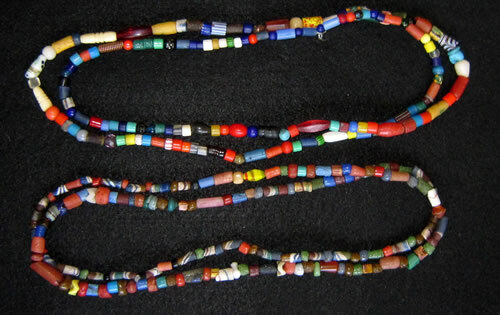 I got four strands, 2 with large beads that are about 36 inches long and 2 with small beads that I think are a little shorter. 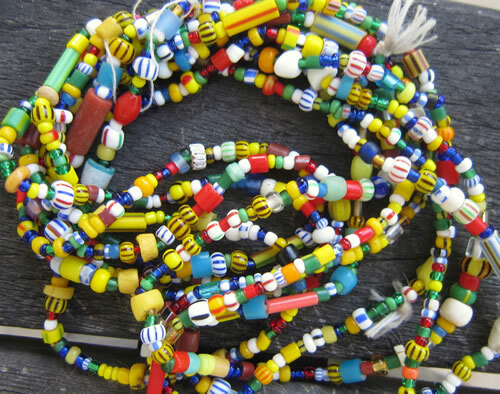 All of the glass beads have terrific color. This is something I was considering buying recently - and even had them in my cart at FMG. Luckily, they ended up selling out of the large ones. I'm glad, because I got all of these for $3, and I know they were more per strand at FMG. I also bought some jewelry that had components that I thought were perfect for re-use. I've already started tearing those apart and re-assembling them. I'll post before and after pictures later this week.